The Excel library can be used to export a grid or table to a workbook document on the client machine or read an Excel document and display its data in the browser. The library can even be used to solve formulas in the browser just as they would be calculated in Excel, all without sending anything to the server. Having IntelliSense like this in place will greatly improve your productivity when working with the Excel library because you have access to important information about how to call each function and what they return. You can easily create a new workbook instance using the Workbook constructor, which optionally accepts a format type. The workbook format controls the type of data written out when the workbook is saved as well as the capabilities and limits of the objects at runtime. For example, when using the excel97To2003 or excel97To2003Template formats, worksheets can only have 65,536 rows and 256 columns, whereas in all other formats, worksheets can have 1,048,576 rows and 16,384 columns. Every workbook needs at least one worksheet to be in a valid state. However, when a workbook instance is first created, it has no worksheets. Trying to save a newly created workbook will result in an error. To add a worksheet, use the add function of the workbook’s collection of worksheets. Note: The Worksheet function should never be used to construct an instance directly. In fact, many of the objects in the Excel library should never be created via constructors as they must be managed by the owning workbook and it should control their creation. Notice how the add function accepts a string: the name of the worksheet to be created, and returns the newly created worksheet instance. Many collections in the Excel library follow a similar pattern, where the add function accepts the information required to create the instance, and returns the newly created instance. Once you have created a worksheet, the next step is most likely to populate it with data. There are a few ways to do this depending on your needs: more readable code or faster code. To add data to a cell using the most readable code, you can use the getCell function on the worksheet to obtain a reference to a cell instance and then set its value or apply a formula. This code snippet shows a few things. First of all, it shows the getCell function being used with an A1 style cell address. This is the default cell reference mode of the workbook when it is created (you can get or set the cell reference mode using the workbook’s cellReferenceMode function) and by default, getCell will use the workbook’s cell reference mode to parse the reference string and get the cell. This code also demonstrates the ability to override this cell reference mode and use the R1C1 mode to parse the reference instead. The getCell function can also accept the name of a named reference which refers to a cell. The call can optionally accept another cell instance as an origin cell if the reference string represents a relative reference with offsets, such as ‘R[-3]C’. In addition to getting cell instances, this code also shows how to set a cell value with the value function. This function allows you to specify a Boolean, Number, String, Date (Note: Dates are not yet fully supported in the CTP, and may cause exceptions when setting them on cells or loading/saving a workbook with them as cell values), ErrorValue instance to represent an error literal and a FormattedString instance to represent text with mixed formatting. As you can also see at the end of the code, the value function can be specified with no arguments to get a cell’s value. Many functions in the Excel library representing read-write entities follow this pattern: if they are supplied an argument, they set the value and if they are invoked without arguments, they retrieve the value. This code also demonstrates how to set formulas on a cell with the applyFormula function. 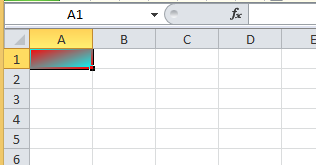 The function accepts the formula string in the cell reference mode currently being used by the workbook (A1 by default). This code also shows that the formula’s calculated value can be obtained immediately by getting the value of the cell owning the formula. And this code is much more readable, although the longer line of code above can still be used. This change results in the least readable way to set cell values, (which is only slightly less readable than the previous example) however, this approach is much more performant since it prevents the creation of 3,200 cell instances and therefore reduces a lot of memory pressure. Note: Another change which could not be made in time for the CTP was the ability to pass colors where WorkbookColorInfo instances are required. WorkbookColorInfo can represent accent and tinted colors, but in many cases, a normal RGB color with no tinting will be specified. In these cases, the color string should be sufficient and it should get wrapped in a WorkbookColorInfo automatically. This will be done for the RTM, but for the CTP, any place accepting a WorkbookColorInfo will need to have one passed in manually as shown in the snippet above. This function accepts a single callback function which will either be passed an error that happened during saving or the final data saved. This data is a Uint8Array containing the saved bytes in a representation that Microsoft Excel is able to recognize. This saved data can sent back to the server to prepare it for download or converted to a Base64 encoded string to be stored for later. Note: Currently, the save operation and callback occur synchronously, but this may change in the future if support for asynchronous saving is added. Similar to the save method, the callback function will either be passed an error that happened during loading or the newly loaded workbook instance. Note: Currently, the load operation and callback occur synchronously, but this may change in the future if support for asynchronous loading is added. After loading, you can access the worksheets and cell data as described above. This code uses the getText function on the cell instance to get the value as it would be formatted in the display. You can also obtain this text without going through a cell instance by using the getCellText function on a row instance instead.